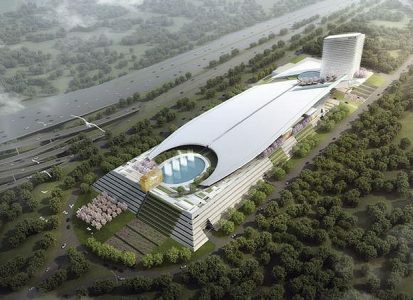 MGM’s National Harbor casino resort (currently under construction on the banks of the Potomac River in Prince George’s County) is on pace for a year-end opening. When complete, the casino complex will have 3,600 slot machines, 140 gaming tables, a 300-suite hotel and a 3,000-seat theater. It will be home to restaurants by culinary headliners José Andrés, Marcus Samuelsson and brothers Bryan and Michael Voltaggio. MGM National Harbor recently revealed the designs for its premier suite offerings at the $1.3 billion resort. Complementing the modern elegance of the resort, the suite designs – developed by Studio GAIA – draw inspiration from the forest and water elements native to the Maryland area and feature stunning views of the surrounding landscape. The collection of 74 suites at MGM National Harbor will provide guests with an elevated experience at the luxury 308-room resort. Each suite, ranging in size from 588 to 3,210 square feet, will feature distinct location, size, layout and amenities, resulting in a unique guest experience specific to each suite type. To take a look at the suite designs at Travel Daily News, click here.